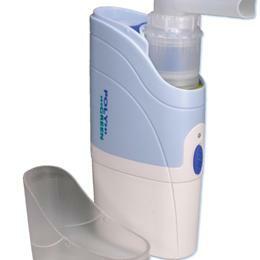 Compact Compressor Portable Nebulizer: This Compact Hand Held Design Is Lightweight And Simple To Operate. Weighs Only 20 Oz W/ Battery. The Compact Nebulizer Gives Quick Treatments, With A Particulate Size Of 3.0 To 4.0 Microns. Safe, Convenient, And Easy To Use. Comes With: Carrying Case, Two Face Masks (Adult And Pediatric), Three Power Sources (Ac Power Adapter, 12 Vdc Power Adapter, And Re-Chargeable Battery), And Replacement Filters. Adult Mask With Adapter.